Added two more wantlists to my player collection last night and posted links to all four on the blog sidebar, just below "Top 5 Posts." 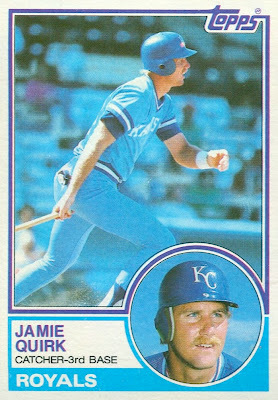 Jamie Quirk caught and played utility man for nearly two decades in KC, Milwaukee, St. Louis, Chicago, Cleveland, Oakland, Baltimore, and New York (but mostly KC). He did a little of everything for everyone and switched to coaching after retirement, currently on staff with Houston (Jamie Quirk wantlist). 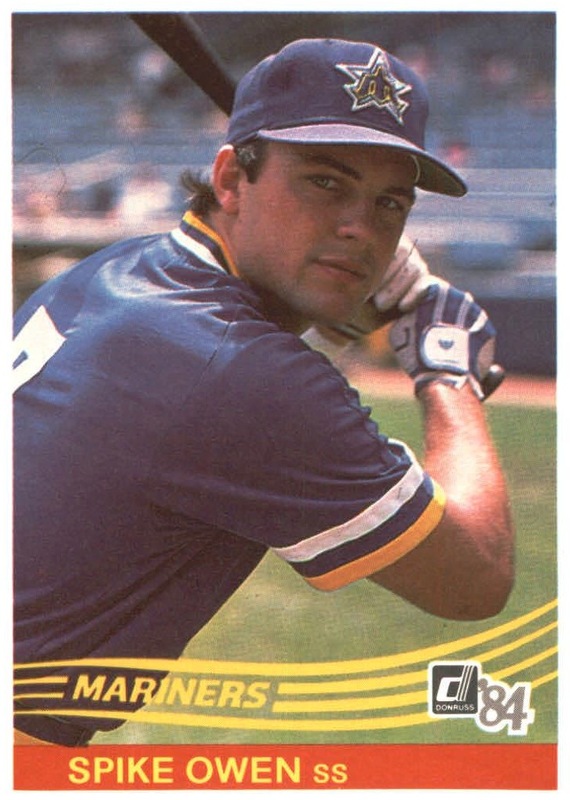 Spike Owen was my favorite Mariner during the 1980s and I was bummed when his Seattle tenure ended with a trade to Boston in 1986. Spike went on to play good-glove shortstop for Montreal, New York, and Anaheim. He continues in baseball as manager for the Texas AAA affiliate Round Rock Express (Spike Owen wantlist). I've got a variety of low-grade vintage cards to trade for hits to my player collections; just leave a comment on their wantlist pages or send an email through my Google profile! 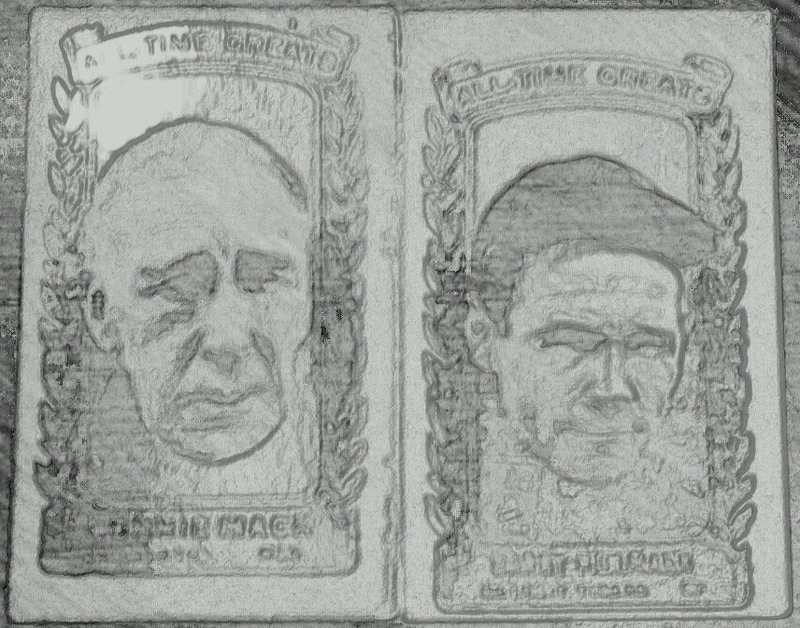 CONTEST: This pair of 1960s cards received a virtual gravestone rubbing, very sketch-like. First to identify the set, year, and players via blog comment wins them. (Please guess only if you actually need/want the cards. :-) Both are HOFers. Guess: 1963 Bazooka All-Time Greats. 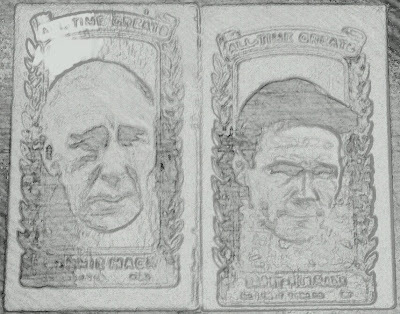 Connie Mack and Harry Heilmann. Wow, that was super-fast! Congrats to CCC, who wins with guess #1. Here's more on the 1963 Bazooka ATG set, which Topps produced as a parallel to their "normal" one featuring active players.